One of director Guillermo Del Toro's more successful ventures into the mainstream, Hellboy (based on Mike Mignola's comic) was marked by his typically extraordinary visual style and a terrific, humorous performance from Ron Perlman as the eponymous demon busting hero. A genre-mashing timeline begins during World War II, where a failed Nazi experiment brings the titular hero into our world, where he grows up to become part of the Bureau for Paranormal Research and Defence (BRPD), battling a reincarnated Rasputin. 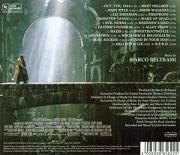 Del Toro's witty, intricate rendition of the hinterland between fantasy and reality saw Hellboy garner great reviews in 2004 – abetted brilliantly by a diverse and exciting score from regular collaborator Marco Beltrami. 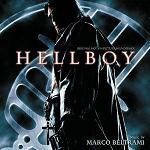 Although it wasn't to continue in 2008's second instalment (the director finally achieving his goal of working with Danny Elfman instead), Beltrami's multi-faceted work, reflecting the many diffuse aspects of the Hellboy story, is an invigorating treat. Unsurprisingly, given a film of this ilk, the opening is a fairly moody and broody one, introducing the memorable main theme in vaguely dissonant fashion in "October 7th, 1944" before a spellbinding choral variation in "Meet Hellboy" and, especially, the terrific Morricone trumpet/guitar-led swagger of "Main Title", show us the power at Beltrami's fingertips. The much-welcomed Morricone influence is apparent elsewhere, especially in a track like "Wake Up Dead" starting and ending in operatic fashion, sandwiching an Elfman-esque tinkling groove in-between. There are even some nicely eccentric sections for the interpersonal character relationships, including a "deconstructed" theremin element in "BRPD" and a funky laid back rhythm in "Rooftop Tango" as Hellboy's unrequited love for fire starter Liz Sherman (Selma Blair) threatens to spill over into jealousy. It's a remarkably even-handed score, with equal weighting given to the alternately menacing, romantic and adventurous sides of the film and its characters. Of course Beltrami, being a horror vet of the Scream franchise and others, is an ideal choice for underlining the darker aspects of the music, with the darkly beautiful pieces "Snow Walkers" and "Evil Doers" showcasing some of Beltrami's edgier qualities at their best. Action music is surprisingly thin on the ground, although when it does show up ("Fireproof"/"Nazis"/"Alley Fight") it's absolutely terrific, uncompromising stuff, shrill horns, distorted winds and chopping strings bringing back fond memories of Scream's thrilling chase music. The main theme is often also chucked in to give a proper sense of identity and consistency. However, by far the most interesting tracks are the ones playing with more emotional heft, a side of Beltrami we hear all too infrequently. Both Hellboy's love for Liz and adopted parent Professor Bruttenholm (John Hurt) are scored flawlessly ("Investigating Liz"/"Father's Funeral") with gorgeous searching orchestra and choir reaching heavenwards quite unlike anything else in Beltrami's ouvre. There's even time for a remarkable operatic duet in "Kroenen's Lied", a piece so unexpected yet fitting so perfectly into the musical tapestry that it makes one better appreciate Beltrami's instincts in bringing it all together. Again the Morricone/Elfman influence draws favourable comparisons, although never at the expense of Beltrami's own voice (one of the most recognizable in modern film music). Fittingly, it builds in classic fashion to a brilliantly emotional, heroic two-hander, "Stand By Your Man" and "Hellboy and Liz", reinstating the enjoyably broad strokes Beltrami has used to paint his score; when allowed to compose on the broadest of canvases he is one of the most dynamic and exciting around. More's the pity that he wasn't on-board for the second film – here's hoping he returns for a third. It's a brilliantly eclectic superhero score, thoroughly old fashioned yet bracingly modern, doing the impossible in film music: maintaining a consistent tone in spite of the humour, heroism and danger also on display. That's the sign of a great musician. This wonderful score is readily available and can be found at Amazon.co.uk and Amazon.com.